A score of the song as published by G. E. Blake of Philadelphia, Pennsylvania. 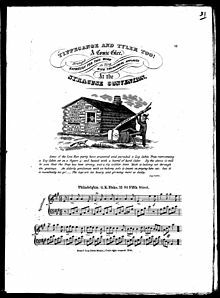 "Tippecanoe and Tyler Too", originally published as "Tip and Ty", was a popular and influential campaign song of the Whig Party's colorful Log Cabin Campaign in the 1840 United States presidential election. Its lyrics sang the praises of Whig candidates William Henry Harrison (the "hero of Tippecanoe") and John Tyler, while denigrating incumbent Democrat Martin Van Buren. Folk music critic Irwin Silber wrote that the song "firmly established the power of singing as a campaign device" in the United States, and that this and the other songs of 1840 represent a "Great Divide" in the development of American campaign music. The North American Review at the time even remarked that the song was, "in the political canvas of 1840 what the 'Marseillaise' was to the French Revolution. It sang Harrison into the presidency." Today, however, the slogan Tippecanoe and Tyler Too is better remembered than the song itself. A campaign banner with the "Tip and Ty" slogan, derived from the song. The song was written by Alexander Coffman Ross, a jeweler of Zanesville, Ohio, in 1840, to the music of the minstrelsy song, "Little Pigs". He first performed it at a Whig meeting in Zanesville, and it came to national attention when, traveling on a business trip, he introduced it to a Whig rally in New York. Ross apparently never copyrighted the song. "Little Pigs" itself is not well documented, but the available evidence suggests that there was a substantial adaptation of the score for "Tip and Ty". A historical society in Madison, Wisconsin, claimed that a local, the young nephew of future U.S. Supreme Court justice Levi Woodbury, wrote the first verses of the song and that its premiere performance at a Whig rally came at the suggestion of Woodbury himself. Woodbury was, however, by all accounts a Democrat, not a Whig, and was in fact serving as Secretary of the Treasury under Martin Van Buren at the time. There were many variations on the song published at the time, especially ones with new verses. It has been called a "satirical, expandable text that permitted, nay urged, singers to add their own lines". Ross's version has twelve verses and a rousing chorus. There is repeated reference to rolling balls and constant motion, and rolling "great canvas balls" became a physical prop in the campaign pageantry, alongside the better-known log cabins and hard cider barrels. The song's appeal has been compared to that of a great pop novelty song, as against the relative seriousness of most campaign songs. Martin Van Buren is derided as "Little Van" and "Little Matty" and his supporters as "Vanjacks". These are contrasted with the rustic virtues of Harrison and the inevitability of his victory throughout the states. The refrain For Tippecanoe and Tyler too is highly euphonious: it exhibits a triple alliteration, an internal rhyme, and nearly forms an iambic tetrameter. The song was part of the 1968 Off-Broadway musical How to Steal an Election and its cast album, with music and lyrics adapted by folk singer Oscar Brand. The song has been recorded in a traditional form multiple times: in 1960 by Broadway veteran Howard Da Silva on the album "Politics and Poker - Songs to Get Elected By" released by Monitor Records (New York), in 1978 by Peter Janovsky on the album Winners and Losers: Campaign Songs from the Critical Elections in American History, Vol. 1 for Folkways Records, and in 1999 by Oscar Brand on the album Presidential Campaign Songs: 1789 – 1996 for Smithsonian Folkways Recordings, the successor label to Folkways Records. The band They Might Be Giants recorded an alternative rock version of the song for the 2004 compilation album Future Soundtrack for America, using a three verse lyric as adapted by Oscar Brand (from the first, eighth and second verses in Ross's original). Appropriately enough, the compilation was a benefit album for political causes relating to that year's election. John Flansburgh of They Might be Giants has remarked on the song's historical success as "the 'Rock Around the Clock' of campaign songs" and "the 'I Want to Hold Your Hand' of campaign songs." ^ a b Silber, Irwin (1971). Songs America Voted By. Harrisburg, Pennsylvania: Stackpole Books. ^ As cited in Silber. ^ a b c Schrader, Arthur (2001). "Singing SHEAR History: A Commentary and Music Sampler". Journal of the Early Republic. ^ Historic Madison Inc. (Feb. 19, 2007) "Historic Madison: Tippecanoe and Tyler, Too". The Capital Times. ^ Braiker, Brian (14 July 2004). "They Might Be Onto Something". Newsweek. Retrieved July 10, 2017. ^ Jeckell, Barry A. "Billboard News". Billboard. Archived from the original on August 14, 2006. Retrieved July 10, 2017. This page was last edited on 11 February 2019, at 17:25 (UTC).